The first scholarly biography of Polk, Eugene Irving McCormac, James K. Polk: A Political Biography (Berkeley, Calif., 1922), is still useful. More personal are two volumes by Charles G. Sellers: James K. Polk, Jacksonian, 1795–1843 and James K. Polk, Continentalist, 1843–1846 (Princeton, N.J., 1957, 1966). The first volume is unmatched on Polk's rise to power; the second should be used with McCormac and Pletcher. Polk's own account, The Diary of James K. Polk During His Presidency, 1845–1849 , edited by Milo Milton Quaife, 4 vols. (Chicago, 1910), gives fascinating insights into Polk's mind as well as an account of his daily activities. On foreign policy, David M. Pletcher, The Diplomacy of Annexation: Texas, Oregon, and the Mexican War (Columbia, Mo., 1973), provides a presentation of the interpretation used in the present article. Glen W. Price, Origins of the War with Mexico: The Polk-Stockton Intrigue (Austin, Tex., 1967), is the most detailed exposition of the "plot thesis" concerning the coming of the Mexican War. Justin H. Smith, The Annexation of Texas , rev. ed. (New York, 1941), although originally published in 1911 and thus not based on modern scholarship, contains by far the most comprehensive account of the annexation campaign. More recent is Frederick Merk, Slavery and the Annexation of Texas (New York, 1972). Merk's The Oregon Question: Essays in Anglo-American Diplomacy and Politics (Cambridge, Mass., 1967), contains several chapters on Polk's policies. The second volume of Sellers's biography has chapters on foreign relations. The classic study of the Mexican War is Justin H. Smith, The War with Mexico , 2 vols. (New York, 1919; repr. Gloucester, Mass., 1963), very detailed and still useful, although both anti-Polk and anti-Mexican. Pletcher, cited above, has superseded it in diplomacy. See K. Jack Bauer, The Mexican War, 1846–1848 (New York, 1974), and John S. D. Eisenhower, So Far from God: The U.S. War with Mexico, 1846–1848 (New York, 1989), for military history. Otis A. Singletary, The Mexican War (Chicago, 1960), is a short account of the military action, especially useful on the American occupation of Mexico. David Lavender, Climax at Buena Vista: The American Campaigns in Northeastern Mexico, 1846–1847 (Philadelphia, 1966), provides a good account of the first half of the war. More up-to-date and popularized overviews are Seymour V. Connor and Odie B. Faulk, North America Divided: The Mexican War, 1846–1848 (New York, 1971), and John Edward Weems, To Conquer a Peace: The War Between the United States and Mexico (Garden City, N.Y., 1974). Good biographies of the principal military leaders are Holman Hamilton, Zachary Taylor , vol. 1 (Indianapolis, Ind., 1941); K. Jack Bauer, Zachary Taylor: Soldier, Planter, Statesman of the Old Southwest (Baton Rouge, La., 1985); Charles Winslow Elliott, Winfield Scott: The Soldier and the Man (New York, 1937); and Oakah L. Jones, Jr., Santa Anna (New York, 1968). On the last phase of the war and the negotiation of the peace treaty see John Douglas Pitts Fuller, The Movement for the Acquisition of All Mexico, 1846–1848 (Baltimore, 1936); Robert W. Drexler, Guilty of Making Peace: A Biography of Nicholas P. Trist (Lanham, Md., 1991); and Richard Griswold del Castillo, The Treaty of Guadalupe Hidalgo: A Legacy of Conflict (Norman, Okla., 1990), which, however, concentrates on post-1848 history. A remarkable study of American public opinion on the war, with emphasis on support and the effects of the war at home is Robert W. Johannsen, To the Halls of the Montezumas: The Mexican War in the American Imagination (New York, 1985). It should be balanced, however, by John H. Schroeder, Mr. Polk's War: American Opposition and Dissent, 1846–1848 (Madison, Wis., 1973). THIS IS A NICE ARTICLE. IT REALLY IS HELPING ME WITH MY PROJECT. I LIKE TO READ BUT NOT ON PRESIDENTS. SO CAN YOU PLEASE DO A ARTICLE ON HIM AND JAMES MONROE IN QUICK FACTS FORM..I WOULD BE MORE THAN PLEASED. Good job. Very thorough.(sp?) helped me with my presidents day project. 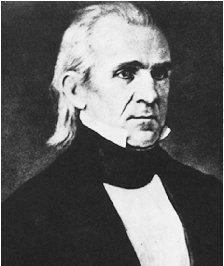 i was wondering if you can send me something on james k polk!!!!!!!!!!!!!!!!!!!! Thanks. Helped me with my Socail Studies assignment. Thanks! Great Website! I am Soooooooooooooo gonna win the presidential debate!!!!! Thank you so much. I have a hole report on this presedent and now i can finish it with all the information I need!